Both group discussion and debate involve exchange of information between individuals regarding a certain topic. They aim to produce a healthy discussion and impart essential facts and opinions. However, the former has a more amiable nature as there are less stringent rules on timeframe and mode of speaking. Based on its etymology which is “discussus” (Latin), group discussants often “break up” a topic to examine various perspectives. In this sense, a group discussion is a friendly exchange of ideas which give more light to the subject matter. The participants are free to express their opinions and aptly rationalize their view points as the main goal of the group is to have a clearer understanding of the selected issue. A topic is specifically chosen by an authority and a time-frame is allotted. 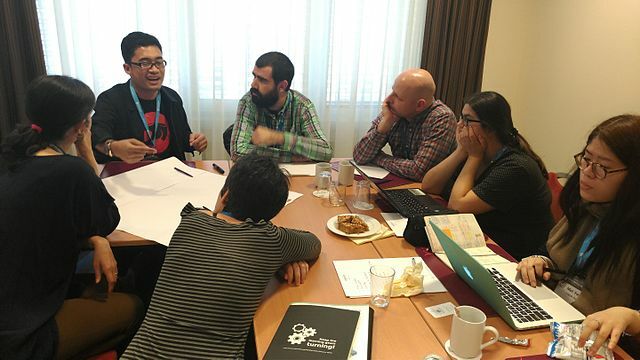 The participants mutually decide on a topic and the time-frame is not strictly set. The discussants have to express their opinions within the parameters of their given role. A nominated leader facilitates the flow of discussion and summarizes key ideas. The word “debate” came from the Latin prefix, “dis-“, which expresses “reversal” and “battere” which means “to fight”. Correspondingly, a debate is an argumentation between two groups or individuals. It is usually a formal competition which showcases the extent of knowledge and reasoning skills of the opposing sides. The debaters have to take turns in countering the other team’s stated key points. Thus, participants have to be keen in spotting flaws in the other side’s arguments. This is also known as the two men debate since there is only one speaker from each camp. The affirmative speaker opens the debate. There are two to three members in each team and the affirmative side starts the debate. There are also two to three members in each team and all of them have a chance to rebut except the first affirmative speaker who closes with his rebuttal speech. There are two to three members from each side. The first affirmative speaker, who will be questioned by the first negative speaker, opens with their entire case. This is followed by the presentation of the entire negative case by second negative speaker who will, in turn, be questioned by the first or second affirmative speaker. The main goal of a group discussion is to have a clearer understanding of the chosen topic. On the other hand, a debate is conducted to verify if a certain standpoint is more credible than its opposite. 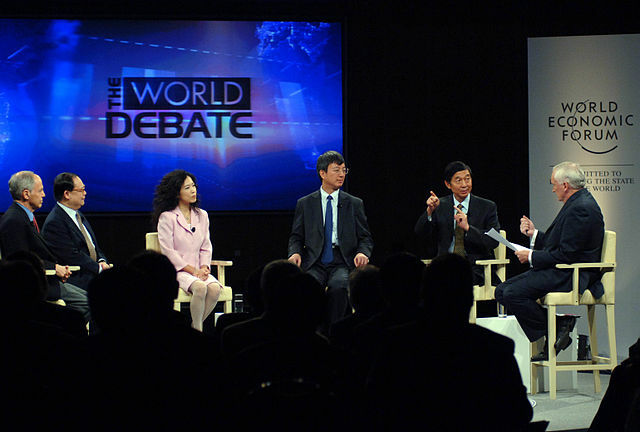 Unlike debates, group discussions are less formal as they do not have strict rules on topic coverage, time, taking turns, mode of speaking, and others. The contradicting positions are evidently stated in the beginning of a debate whereas two opposing opinions are not needed for a group discussion to commence. In a debate, there is a winner and a loser though there are times when the results can be a draw. As for group discussions, the participants are not competing with each other so they do not need to worry about gaining points. Debaters have an audience who listen to the pros and cons of an issue. The listeners have a more passive role as they cannot take part in the argument. On the other hand, group discussants may or may not have an audience and if they would have listeners, some types of discussions welcome input from them. Participants in a debate need to properly take turns in airing out ideas. Conversely, those in a group discussion do not have rules on taking turns. There is less cooperation involved in debates as the opposing sides need to attack or defend opinions. Thus, aggressive speech may sometimes be manifested. On the contrary, group discussions are often more cooperative as they are meant to achieve a more comprehensive and accurate view of a topic. A debate is largely more complex as more preparation, details, and roles are involved. As for a group discussion, this may be done more spontaneously with less guidelines and keypersons. Debaters need to persuade the listeners to take their side while group discussants simply aim to share information. Debates end with a specific conclusion which denotes the winning side whereas group discussions may not have a specific conclusion as there is no winner nor loser at the end. Both group discussion and debate involve exchange of information between individuals regarding a certain topic. A group discussion is a friendly exchange of ideas between people. The common types of group discussions according to conduct of method are: structured, unstructured, role play, and with a nominated leader. The common types of debates are Lincoln-Douglas, Rebuttal, One Rebuttal, and Oregon Oxford. Group discussions aim to share ideas while debates aim to persuade. As compared to group discussions, debates are more formal, complicated, and argumentative. 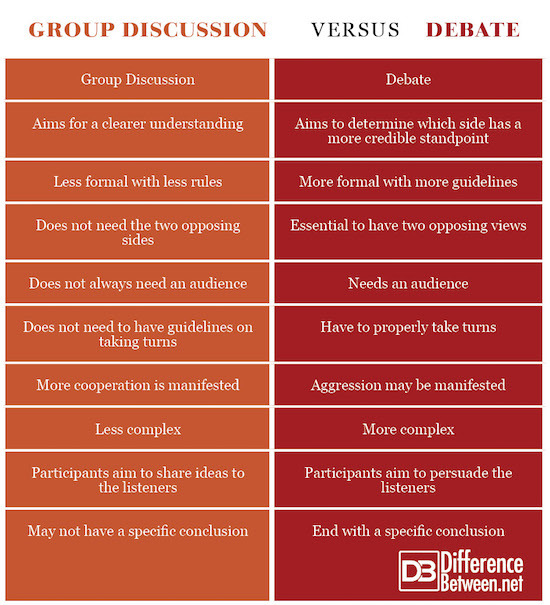 Unlike group discussions, debates need to have two opposing sides. Debaters need to properly take turns while group discussants need not to. Group discussions do not usually end with a specific conclusion while debates do. gene balinggan. "Difference Between Group Discussion and Debate." DifferenceBetween.net. July 23, 2018 < http://www.differencebetween.net/language/difference-between-group-discussion-and-debate/ >. Edwards, Richard. Competitive Debate. New York: Alpha, 2008. Print. Galanes, Gloria and Adams Katherine. Effective Group Discussion. New York: McGraw Hill, 2013. Print. Wolfson, Jonathan. The Great Debate. Naperville: Lightning Bolt Press, 2012. Print.